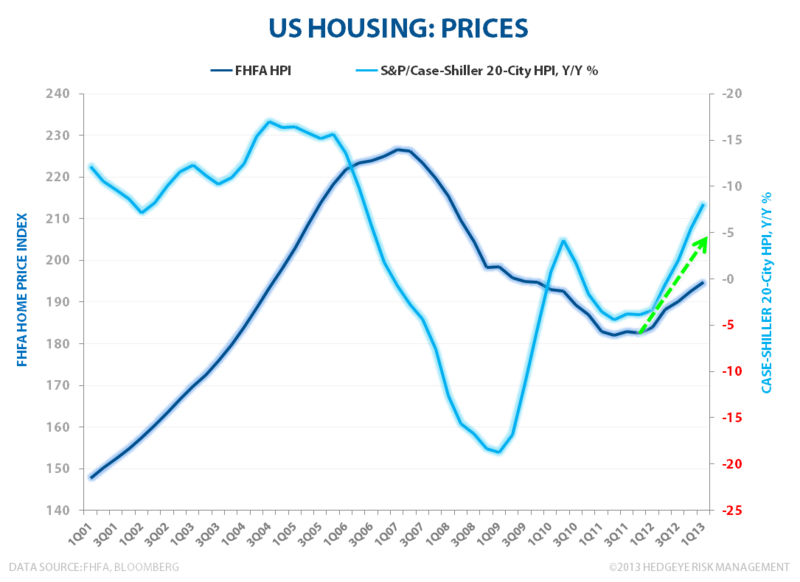 Takeaway: Key housing demand drivers & Demand-Supply dynamics should continue to support prices. We expect a modest Wealth Effect on NTM consumption. 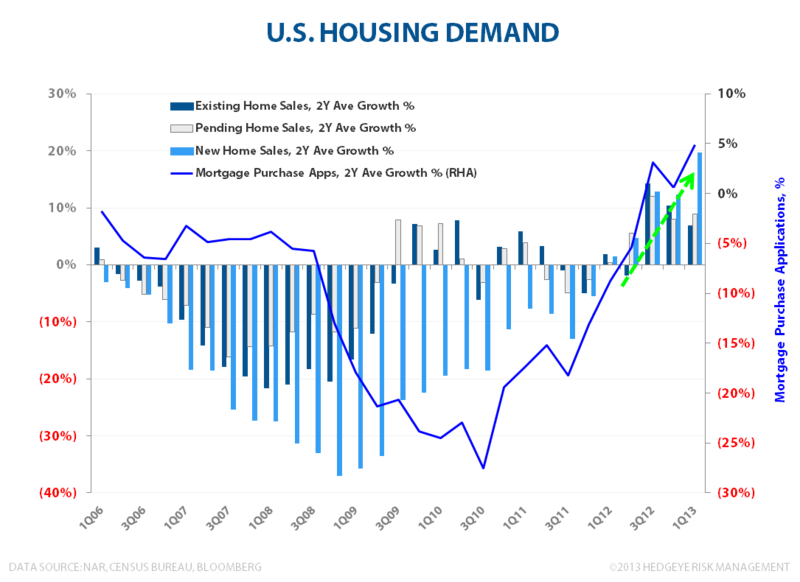 #HousingsHammer was one of our two bullish, domestic-centric Macro Investment Themes in 1Q13 and a key support to our view on domestic #GrowthStabilizing. 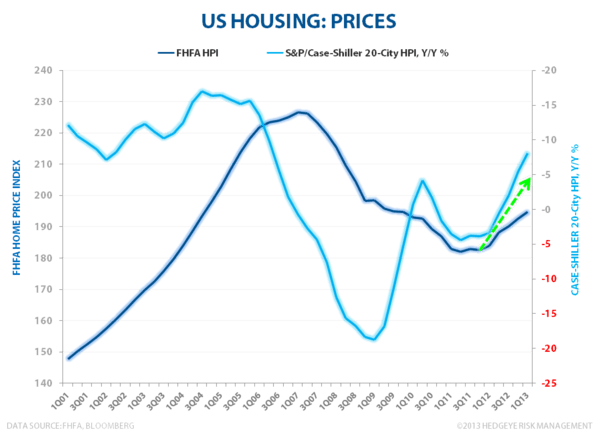 THESIS: In our view of housing as a Giffen good, demand and price interact reflexively as demand chases price higher which, in turn, drives further price appreciation in a virtuous cycle. Employment, Household Formation, Birth Trends & Demographics sit as principal drivers of housing demand and trends across each of those metrics remain favorable. Rising demand alongside ongoing inventory tightness should continue to support further home price appreciation over the intermediate term. Demand – Pending, Existing, and New Home Sale Metrics all continue to reflect rising demand. Credit demand for residential real estate continues to rise while credit standards for prime borrowers continues to ease according to the FED’s Loan Officer Survey. Growth in Mortgage Purchase applications, one of the better lead indicators for housing activity, showed further acceleration in 1Q13. Employment – Labor market trends continue show modest improvement as payroll numbers have accelerated and Initial Jobless Claims continue to show year-over-year improvement. Broad employment growth is of obvious import to aggregate consumer demand, but the age demographics that have characterized the jobs recovery remain particularly supportive of housing demand. The BLS employment by age data shows that, to a large extent, we are still experiencing a barbell recovery in employment with 20-34 and 55-64 year olds remaining the primary beneficiaries of business hiring. With New Household formation centered on the 20-40YOA age demographic, positive employment trends and income stability should provide ongoing support to housing demand on a lag. Births – After the biggest decline in over 40 years, Birth trends are beginning to turn. The correlation between Female Employment growth within the 20-34 Year old cohort and U.S. births is strongest on a 3 quarter lag – the lagged relationship makes common & economic sense as the decision to have a child follows the change in employment status, the initiation of insurance coverage, and a high enough comfort level with job security to take maternal/paternal leave. 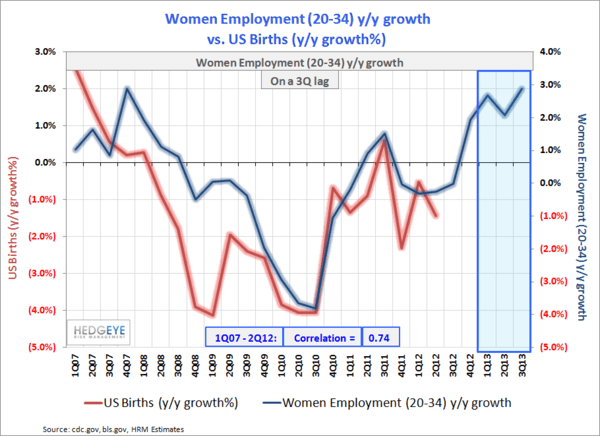 The acceleration in 20-34 YOA female employment that began in 1Q12 should drive positive birth trends from here. Household Formation – Household formation fell well below the historical average into and following the great recession, going negative in 2009. Household formation growth has been a good leading indicator for the housing market as the late 2Q11 acceleration presaged the positive inflection in the housing market into 2011 year end. Following its initial positive inflection in 3Q11, household formation growth has accelerated over the last year and remains positive for forward housing demand. 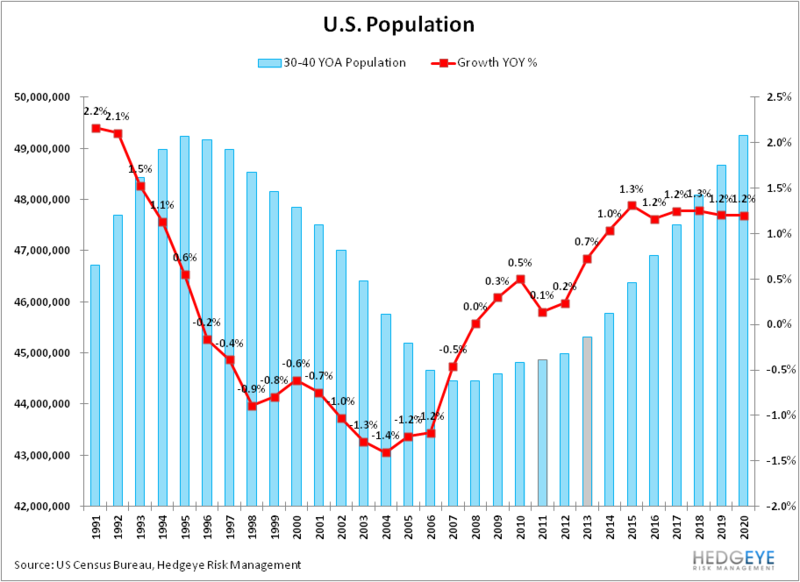 Demographics – from a secular perspective, growth in the 30-40 YOA cohort sits as one of the few population demographic bright spots with that age demographic facing a secular upswing for the better part of the current decade. Accelerating population growth in this key demographic for housing should provide a positive baseline of organic demand growth. 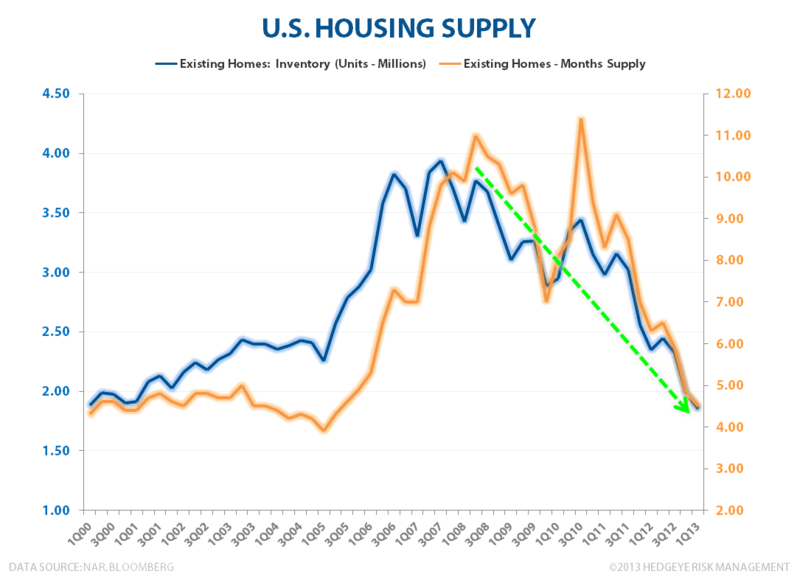 SUPPLY: Rising demand and falling supply is price positive and Inventory tightness has only increased since the start of the year. 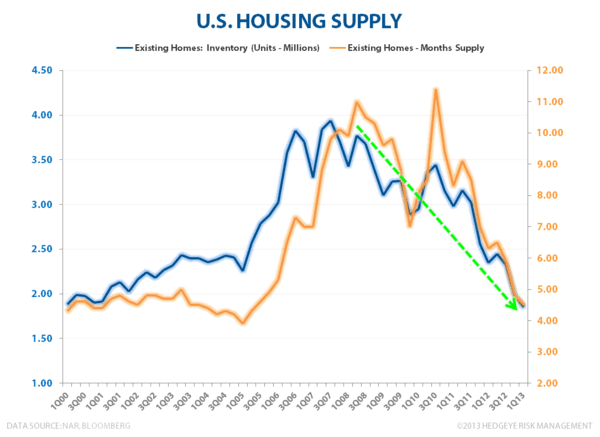 New Home inventory remains near all time lows, Existing home inventory is down >50% since the July 2007 peak and months supply is at the low end of the historical average from 1. 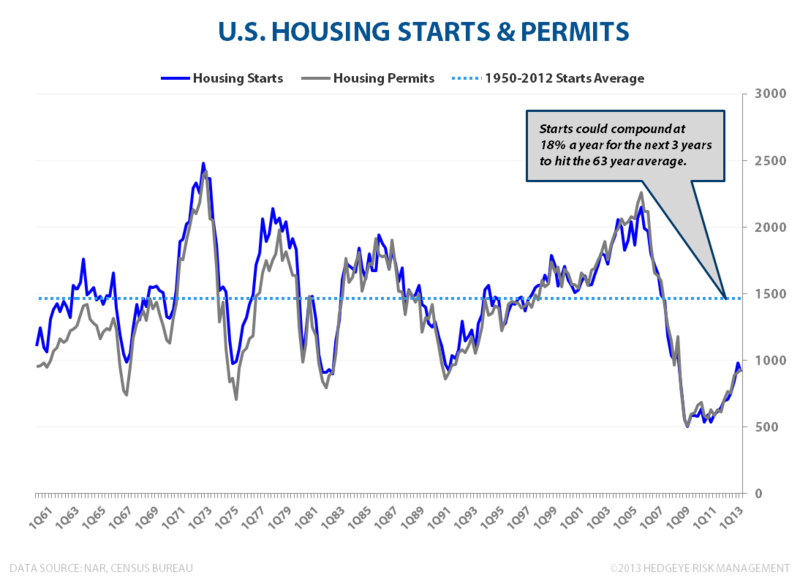 There may exist some capacity constraint as builders work to fill rising demand, but housing starts could still compound at double digits for the next three years just to get back to the longer term average. While any emergent capacity constraint may marginally dampen upside potential in transaction volume, it remains supportive of price appreciation. PRICE: The FHFA Home Price Index, Case-Shiller HPI, and Corelogic home price data all continue to register price acceleration. The latest Corelogic data, tracked by our Financials team, estimates home prices grew 10.2% y/y in March, flat with growth in February, and up from 9.41% y/y growth in January. So long as inventory remains low and the core drivers of housing demand remain positive, we continue to expect demand-price reflexivity to support housing market strength over the intermediate term. Pundits and Policy makers like to casually interject the “wealth effect” term into discussions around financial and housing asset appreciation/depreciation impacts on consumer demand – the term is self-descriptive and, intuitively, the idea that if you have more ‘resources’, your capacity for consumption increases is a fairly digestible concept. There are, however, some key conditions underneath the wealth effect phenomenon that need to be met for increased housing wealth to manifest in increased spending and consumer consumption. Below we take a quick, didactic tour of the wealth effect and the important considerations as it relates to the flow through impact on consumption. Wealth Effect – What is it: When home prices rise at a premium to inflation, real housing wealth increases. The wealth effect ‘theory’ posits that when real housing wealth increases, consumer spending permanently increases by some fraction of that wealth increase in every subsequent year. It’s the “some fraction” part of the theory that sits at the center of ongoing research and debate. Consumers, on balance, don’t immediately convert 100% of a wealth increase into current consumption. Instead, in annuity like fashion, they tend to spread that ability for increased consumption out over their lifetime. Economists attempt to quantify this phenomenon - how consumption changes following changes in housing wealth - by measuring “Marginal Propensity to Consume” – the term used to describe how much consumer spending increases for each additional dollar of housing wealth. In general, studies examining the marginal propensity to consume show that consumer spending increases between 2 and 7 cents for each dollar of housing wealth increase. Actual increases in housing wealth as well as expectations around future price appreciation are thought to be the lead factors driving consumption and spending decisions. The important, if obvious point, here is that even if home price appreciation is positive, if it’s less than what consumer were expecting (& basing spending decisions on) then the impact to go-forward consumption would be negative, and vice versa. Households would increase/decrease their savings rate to close the delta between expected and actual housing wealth changes. Key Conditions: It makes intuitive sense that an increase in real wealth, be it from housing or financial asset appreciation, lends itself to increased consumption. However, a number of key, practical conditions must be satisfied for increased housing wealth to translate into higher consumer spending on non-housing related goods and services. Non-housing Assets: Rising home values don’t serve as direct means for increased consumption. Housing wealth increases need to displace other savings and investment for it free up cash flow to drive higher discretionary consumption. Put differently, an increase in housing wealth only drives increased consumption if households hold fewer non-housing assets than they would otherwise have held. Historically, real increases in housing wealth have been associated with a decrease in the personal savings rate. In effect, individuals let their home do their saving for them while diverting would-be savings into greater current consumption. Equity Extraction: Home price appreciation can help drive non-housing related consumption if it causes households to extract equity via increased borrowing, generally via cash-out refinancing’s (the technical term for this is Net Mortgage Equity Withdrawal, or MEW). Additionally, households can extract equity by simply moving to a cheaper residence with the dollar delta between the two homes representing the increased capacity for non-housing related consumption. In short, if real housing wealth increases but households don’t decrease savings/other investment, increase home equity backed borrowing, or downsize to a cheaper residence, then that wealth increase will be largely ineffectual in driving higher consumption growth. 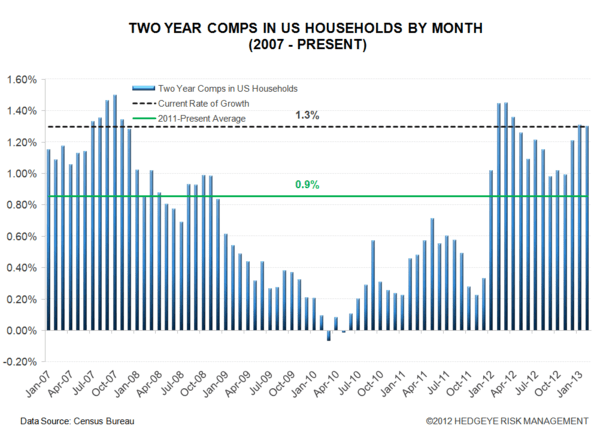 Net-Net, What Kind of Impact Will Increased Housing Wealth have on Consumer Spending and Consumption Growth? The idea of the Wealth effect remains a working theory with the net impact to GDP beholden to a host of situational specific and idiosyncratic economic and behavioral/psychological factors. Despite the inherent uncertainty, applying a few simplifying assumptions allows for a reasonable estimation of the net impact to consumption stemming from a real housing wealth increase. In the scenario analysis below we applied the range of historical estimates for Individual’s Marginal Propensity to Consume (MPC) against the actual increase in aggregate, gross housing market value from 2011 to 2012 (Fed Flow of Funds Data). 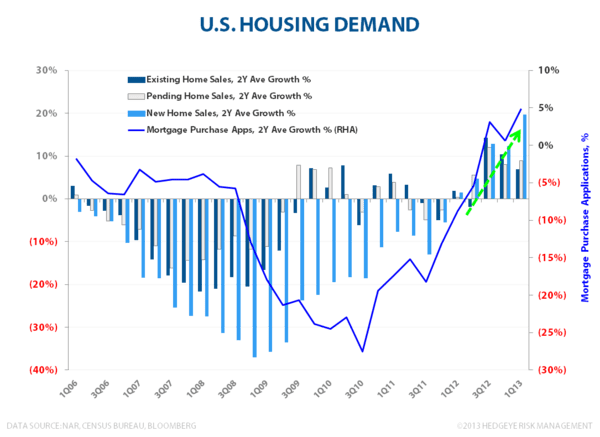 Across the range of MPC’s, on a nominal GDP base of $15.86T, the realized $1.4T increase in gross housing market value translates to 27-62 bps points of incremental growth. Negative Equity discount: Is a rising home price really going to drive incremental spending for an individual going from very negative equity to less negative equity? As of 3Q12, approximately 14% of all homes were underwater – implying that 85% of homeowner are subject to the wealth effect. 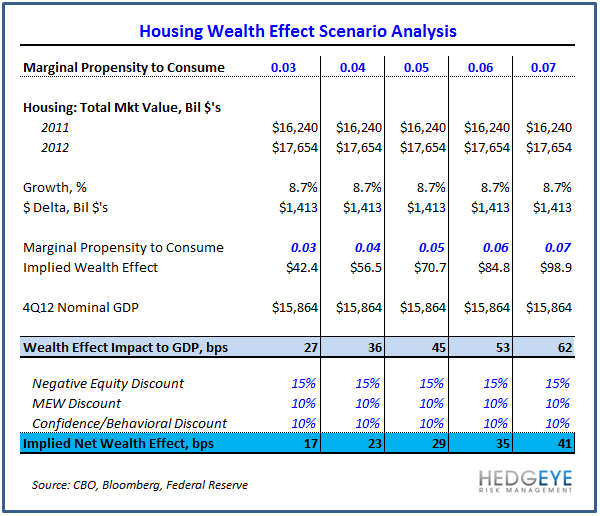 We applied a 15% discount to the Gross Wealth Effect impact to account for negative housing equity in the analysis below. MEW Discount: Net Mortgage Equity Withdrawal peaked at ~$140B during the housing bubble and subsequently went negative into and after the great recession. Here, we take a conservative view and side with the preponderance of data that says the consumer still isn’t in a mood to re-lever. We applied a 10% discount for MEW with the expectation for a depressed impact versus historical precedent. Confidence/Psychological Discount: Expectations around wealth increases play an important part in marginal spending decisions. 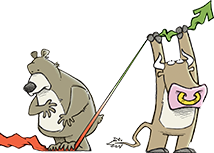 Similar behavioral dynamics tend to characterize positive and negative price/wealth inflections, but they tend to play out in converse – a phenomenon which is largely tied to expectations. Individual expectations around future price changes are generally biased by ‘State Dependence’ (ie. how you feel now) whereby recent price trends color expectations around future price changes. Applied to housing, as home prices rise/accelerate, consumers generally extrapolate forward similar levels of price appreciation. Conversely, coming out of a period of declining prices, expectations around future price changes are probably conservative with consumer needing to see sustained stability/appreciation to drive incremental spending. We applied a 10% discount for this dynamic in the scenario analysis below. Triple-Net, a quasi-conservative approach at quantifying the flow through impact from increased housing wealth to consumer spending suggests we see 25-40bps of incremental consumption growth over 2013. Bonds: Jobs Off, Risk On?